Happy birthday to the fabulous dement1a! May you have a wonderful day and a fantastic year to come! 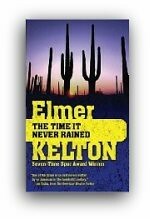 I'd like to take a moment to remember a great author and man, Elmer Kelton (April 29, 1926 - August 22, 2009). I had the privilege of being a fellow participant with him in cross-disciplinary, multi-day colloquia several times in recent years, and over the many roundtable discussions and meals we shared, discussing frontier literature (from Icelandic sagas to cowboy autobiographies), political philosophy, personal history, and our love of literature, I came to admire his graciousness, humility, humor, and fierce intelligence immensely. Elmer -- he told me to call him Elmer, although I think of him as Mr. Kelton -- wrote over sixty novels and received too many awards, honorary degrees, and recognitions to be listed here. Tommy Lee Jones directed and starred in a film based on one of Elmer's books. The National Cowboy and Western Heritage Museum honored him, as did the Cowboy Hall of Fame. It is no surprise that the Western Writers of America named him the best Western writer of all time. I consider his 1973 novel The Time it Never Rained to be one of the most important American novels of the twentieth century, on any subject, in any genre, and I highly recommend it to anyone who wishes to benefit from its keen and poignant insights on the U.S. Western mind and condition. I will continue to think of Elmer as a role model, to read, recommend, and teach his novels, and to miss him. He was a true gentleman, a true artist, and a true original. * My latest dramatic reading for StarShipSofa: The Audio Science Fiction Magazine -- I narrate Nancy Kress's remarkable novella Flowers of Aulit Prison -- is now available for download or streaming here. It was a pleasure to read, and if you listen, I hope you enjoy it! * I will be interviewed on the NPR program State of Affairs on WFPL in Louisville, Kentucky on Monday, August 31, for one hour at 1pm EST (rebroadcast at 9pm). The topic of the show is "The Subversiveness of Science Fiction." The show streams live and will also be available for download after the fact at WFPL's State of Affairs website. * I will be speaking at the McConnell Center at the University of Louisville in Kentucky on September 11 and 12. I'll be leading several seminars for the McConnell Scholars, but I'll also be presenting a lecture that is free and open to the public at 4pm EST on September 11, in Chao Auditorium, Ekstrom Library, on the Belknap Campus of the University of Louisville. (You can call 502-852-3323 for additional information.) The talk will be "What Young Adult Dystopian Novels Can Teach Us," and it's a longer version of the presentation I recently made at Anticipation/The World Science Fiction Convention. Last but not least, "12 Weird Sci-Fi Statues You Can Buy for Your Garden." Needless to say, I wouldn't kick any of these out of my garden. What's not to love? "I can't write about heroes seven feet tall and invincible. I write about people five-foot-eight and nervous." Sorry to hear you're not well, but will definitely be downloading that Nancy Kress story. Thank you dear! Hope you get well soon! I hope you had a great one. Congrats on your lovely new house! I love the statues, and have posted about them myself. *Hugs* back at you. Thank you! Thank you. *hugs* He was a great writer and an all-around class act. Aren't they awesome? Glad you liked them too. I just imagine staring out during a dark and stormy night and catching a glimpse of the lawn zombie. LOL! You know, superwoman, it never ceases to amaze me how productive you continue to be despite illness and everything else! You're still recording podcasts, are scheduled to speak hither and yon, and you were kind enough to send me a copy of that article about Fan Studies 101 by Karen Hellekson. You are so incredibly thoughtful! Reading that got me all jazzed up about media studies, once again. I've never fully understood how you're able to do all that you do when you're in full health, much less having been laid low of late due to your various physical difficulties. Thank you for the post and for checking in and sending me that article. I'll write you soon about what's going on with me, or the current variation on the usual themes. :D And in the meantime, I hope that your doctors are all colluding against your illness to make sure you're back to being your usual, chipper self! And hey- soon the allergy season will be over, something I'm sure you're looking forward to. Oh, you're so kind, my dear! The Kress reading was recorded about a year ago, so it's not new, but it's one of my favorite stories I've narrated. And thanks for the good vibes - the H1N1 quarantine's over, but the sickness left me with complications (asthmatic bronchitis) that are taking their own sweet time to respond to medication. Still, I'm hugely fortunate compared to many asthmatics who have contracted that flu, as I managed to avoid full hospitalization and *knock on wood* pneumonia. So I can't complain! Apologies for being so quiet in general, though. I need to catch up with everything! "I consider his 1973 novel The Time it Never Rained to be one of the most important American novels of the twentieth century..."
Good enough for me. I have put it on my request list at the local public library. Thanks for the recommendation. Thank you for reading it! I don't often read Westerns, and I never would've read this if it hadn't been highly recommended to me. I have an ongoing frustration with how great works (often, as you know well, fantasy and science fiction) get pigeonholed into little subgenre categories and become almost inaccessible to anyone who isn't in the know, who is just looking for a great read. This is one of those books: it's steeped deeply in its time and place, but it speaks to the larger human condition in a remarkable way, I think. And it certainly has appeal for readers who don't normally read "Western" books. I truly hope you enjoy it! I'd love to know what you think of it. Kelton was the real thing, too: he knew his subject firsthand. I listened to the Kress story shortly after it was released and your narration is masterful! A great story and a great reading to match - well done! I'm ashamed to say I've never even heard of Elmer Kelton, but I'm looking forward to getting to know him and his work posthumously. Keep on getting better, Amy! Thank you so much for your kind words about my narration! I really loved the story, too, and I'm so glad you found it to be enjoyable. I wouldn't have known about Elmer Kelton's work if it hadn't been highly recommended to me. It's frustrating to me that works get shoved over into little subcategories and disappear, so you need to be in the know to find some great reads. For example, I don't regularly read "Westerns," but his work, although steeped in its time and place (in the case of The Time It Never Rained, mid-20th century Texas), speaks eloquently, I think, to the larger human condition, and any reader could find a great deal of meaning in it. I hope, if you do read his work, you find it as powerful and enjoyable as I have.